Having the unique approach of implementing an “EU-LIVE modular platform” as its basis, the focus of the project lies on creating a vehicle which combines cost-efficiency, reduction of negative environmental impacts as well as futuristic design and user-friendliness. In order to realise this vision, an International Design Contest has been called out and six highly qualitative L6e concepts have been chosen to enter the Redesign Phase which ended on March 30, 2016. Currently we are conducting the evaluation process of the 6 concepts after which the final winner will be announced on April 18, 2016. 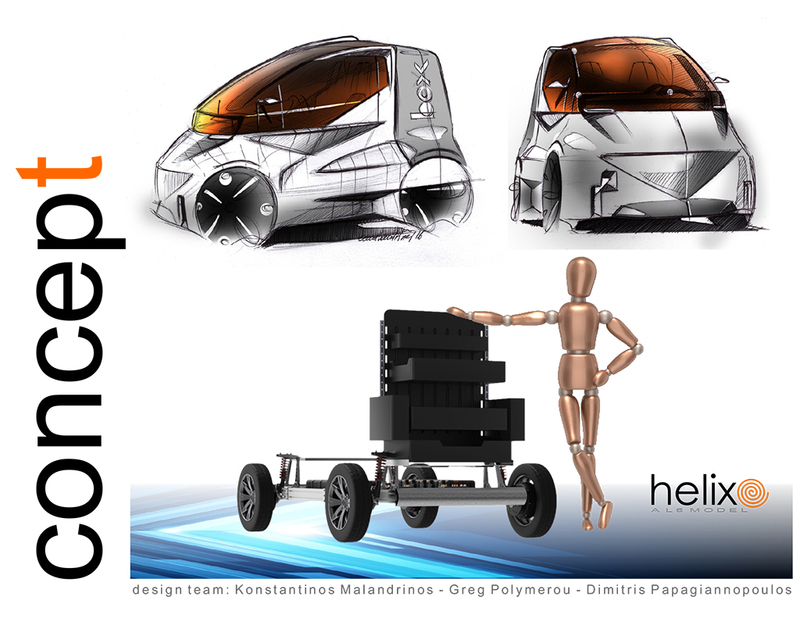 The winning concept will be advanced into a virtual prototype and then undergo a feasibility study. In the closed mode of the roof the vehicle proves to be the perfect choice for fast travelling with only few luggage. The second, open mode, on the other hand, transforms the concept into a comfortable city-buggy with either more storage space or a second seat and ensures a fun driving experience. Only having a length of 2,5m, the vehicle is driven by two wheel hub engines of which the batteries are placed under the storage space in the back of the car. 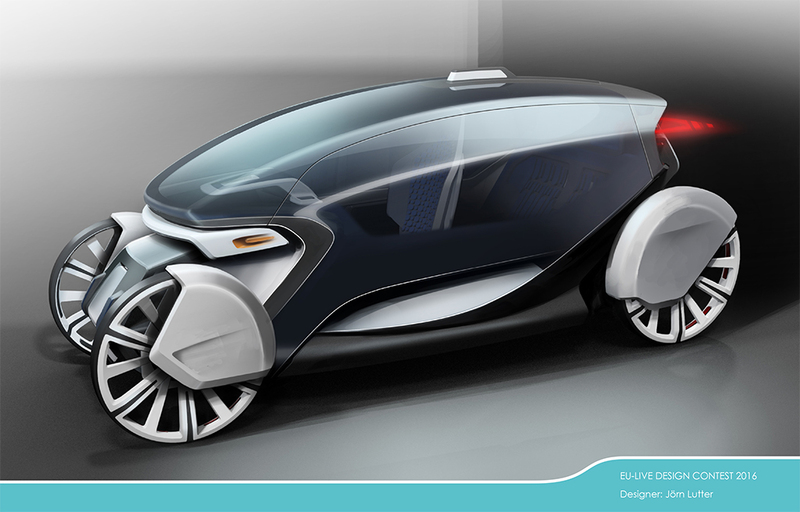 With its small size and an adapted interior for easy cleaning, the concept can be optimally used for car sharing. The “Smart Mobility” vehicle is the perfect solution for an individual short trip through the city. 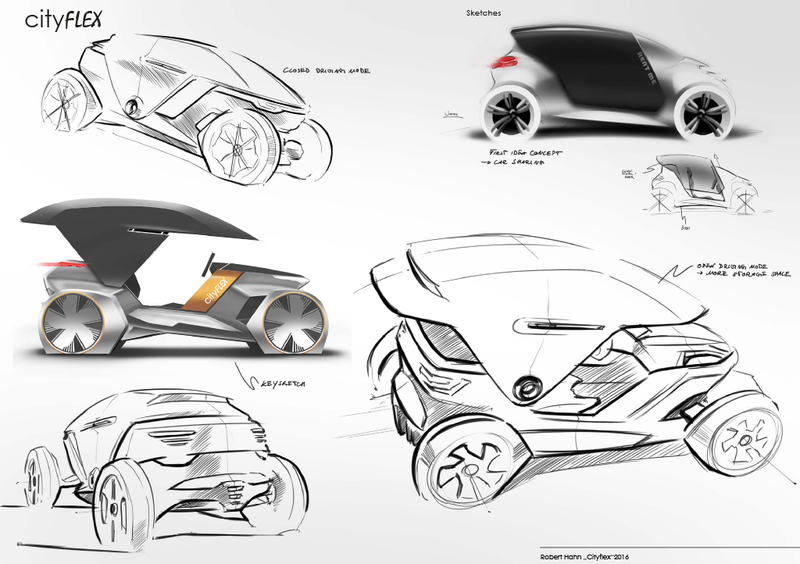 Thanks to its scalable platform the car is extraordinary in its possibility to reduce its length, enabling the user to park more easily, as well as to enlargen its size, providing the opportunity to take a rear passenger along. The vehicle carries a couple of top cases located outside the passenger compartement in order to gain space in the inside of the car. This storage system can be adapted for professional needs (e.g. bigger compartment) and is also suitable for an electric car-sharing service. Aiming to take the idea of car sharing to the next level, the idea of “Flexividual” is to enable a seamless switch between using a car, bicycle or public transport and walking. One of the greatest disadvantages of the vehicles presently used for car sharing is the lack of space necessary to store a significant amount of luggage or a bicycle. Providing a solution for this problem, the “Flexividual” is equipped with a trunk, which can be extended for almost 0.5m, simply by pressing a button. Therefore, the user is enabled to drive longer distances by car and then change to riding his bicycle, just as he would when using public transport. Additionally, the car has incorporated an outer display. It is up to the user whether he shows the destination of his trip and therefore permits other people heading into the same direction to spontaneously join the ride. Considering the newest state of technology, the car could be charged through the usage of induction ports, which is expected to become an increasingly spread method of charging electric cars, since it frees the user of the tedious task of opening a cap and plugging in a tab. 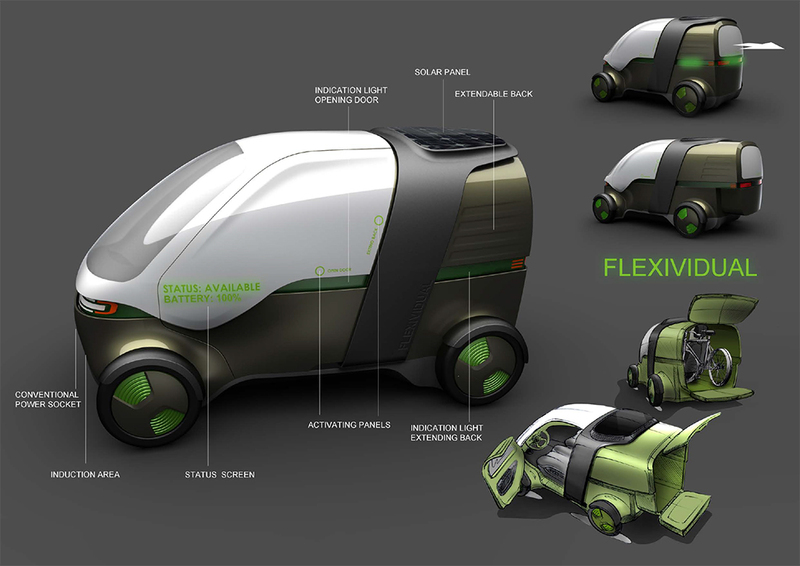 Furthermore, “Flexividual” convinces with its integrated solar panel on the top of the car, using the sunlight as an additional power source. The main materials of the car chassis will be carbon fiber reinforced plastics. 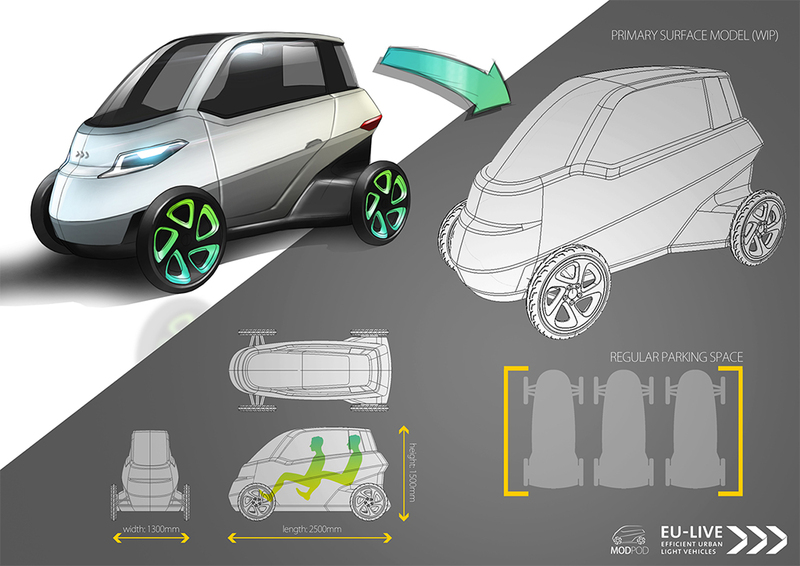 The “Helix” concept aims to manage the shift from the use of common oil and its negative environmental effects to the use of “clean” power sources, which comes together in the development of the electric vehicle. Making a significant contribution to reducing environmental pollution and minimizing the carbon footprint of cars, the “Helix” is greatly improving the quality of urban life. Due to its small size and the adoption of batteries, which require less space and cost, the vehicle demands a way lower overall cost. Moreover, a common to all platforms will allow an apparent reduction of development costs and therefore lead to a reduced sales price for the end user. Consequently, the “Helix” offers the services demanded by prospective costumers at a way lower price compared to the corresponding conventional vehicles. The approach of MODPOD is based on the simple, yet powerful statement: “Taking the most out of the City”. With its modular structure it equips the user with numerous varieties of using the MODPOD, wether it is taking a girlfriend to dinner, delivering pizza or transporting the luggage needed for a weekend away. Its leightweight, aerodynamic and appealing design, makes it the perfect companion to make the most out of the city, since it will not only deliver the feeling of attractiveness but also combines it with a vibe of seriousness and intelligence. As an Ultra-Efficient Electric Vehicle, the MODPOD exceeds the users expectations at a very low cost, spending only 1€ per 100km. Don´t let the future pass by, choose the MODPOD. The idea behind the concept of “SightseeingTaxi Berlin” is a vehicle, that combines the flexibility of a bike rickshaw with the comfort of a conventional taxi. Additionally, it will include the sightseeing aspect of modern “velotaxis”, which are commonly used in western cities. The “SightseeingTaxi Berlin” will operate as an offer to move between destinations in urban areas with the advantage of being provided interesting information about the significant places and sights of the city. Consequently, this will ensure a decisively greater appeal and will motivate tourists to choose the SightseeingTaxi Berlin instead of a conventional taxi. 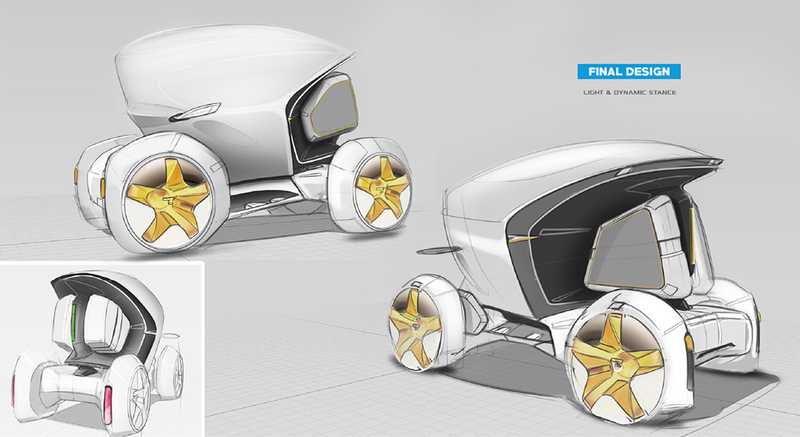 The proportions are related to a modern bike rickshaw, with the ability to get access to different transport niches. Despite its low passenger capacity, which is limited to two, the SightseeingTaxi Berlin still keeps up with a regular car, which averagely carries the equivalent number of people. In an advanced development stage the vehicle may also provide the possibility to function autonomously.